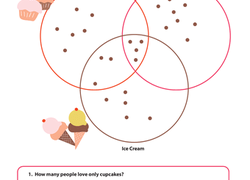 Tickle your sweet tooth with this graphing worksheet! Your little baker will practice analyzing the data in a circle graph (or pie chart). 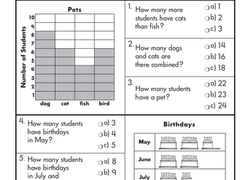 Your child can practice basic math and symbol recognition with this pictograph worksheet. Pictographs are a great introduction to working with data and graphs. Kids help the hamburger cafe compare the number of hamburgers they sold using pictographs. Tally Marks: Keep the Count! Help your second grader practice using tally marks with this worksheet, and next family game night, she can keep score! Boost your child's data know-how with a lesson on reading and understanding a math pictograph, a kind of graph in which pictures stand in for number data. Kids practice representing a set of data using three kinds of graphs: a bar graph, pictograph, and pie graph. 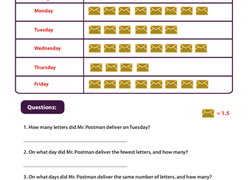 With these pictograph questions, your kid will hone his skills at reading and interpreting graphs. Help the concept of graphing really sink in by challenging your second grader to graph kids' favorite colors using a table, tally mark table, and grid. Introduce your second grader to graphs with this worksheet that asks kids to read a pictogram and answer a set of questions. This pictograph shows how many hikes Eric and his friends went on this month. Use the information to answer questions and determine who hiked the most. 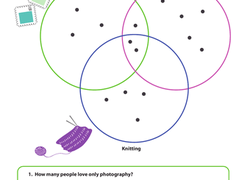 Kids practice reading a Venn diagram about favorite hobbies and answer questions about it in this 2nd grade math worksheet. Can you tell who made more free throws? Practice reading and using graphs, as well as basic arithmetic, with this quiz-style worksheet. See how Susie's lemonade stand is doing! Students will learn how to analyze and compare data by answering questions based on the two pictographs. Hey bookworms, can you read this pictograph? 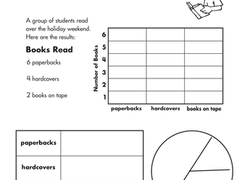 Give your second grader a fun way to practice reading and using graphs with this quiz-style worksheet. Kids practice reading a Venn diagram about favorite desserts and answer questions about it in this 2nd grade math worksheet. Your child might not be ready for statistics, but she can practice using pie charts with this fun, cute worksheet. 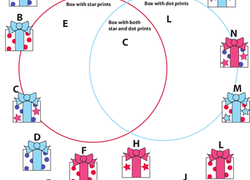 Kids practice making a Venn diagram about kinds of gift wrap by sorting the gifts in their correct spaces in this 2nd grade math worksheet.